Today I am really going to expand your melon horizons by this super amazing Watermelon and MuskMelon Salad. The first time I expanded my melon horizons was in Rome.We had one free evening in Rome and we decided to explore the beach a few kms away from the city cause we are suckers for any waterbody.The beach was blah but we stumbled upon an eatery where they served us melon wrapped in prochitto.It was a simple dish with just two ingredients but it gave me something to ponder about. This dish is simple in its thought but it’s power packed with textures and flavour variations.The minute you have a mouthful of this you will be hit with sweet, tangy,salty and fresh flavours with a textural variations of crunchy melons and soft creamy ricotta cheese. What I liked most about the Watermelon and MuskMelon Salad isn’t anything to do with salad at all but the fascination with which my baby ate the melons.There is such enchantment in the wonder expressed by babies when they see something new.Vansh is fascinated with the colour red-he didn’t appreciate the musk melon as much as he loved munching on the red succulent watermelon. Anyhow,Don’t let the summer pass you by before making this enchanting salad. 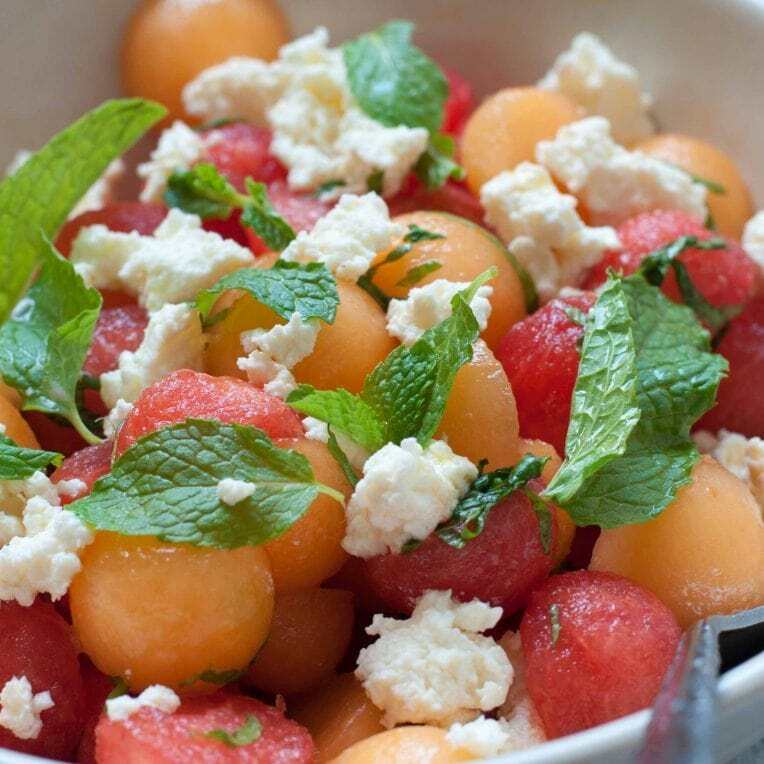 This is a two colour Melon salad where I have used watermelon and musk melon.You can make it more colourful by adding other types of melons too.Honeydew or any other type of cantaloupe will also work here. If you don’t have ricotta, you can make it at home or buy it.Also use goat cheese or feta cheese instead.As always when using cheese taste it before seasoning your dressing to account for the salt. containers with lids for storing salads and curries in the fridge. This is such a light summery vinaigrette that you will end up making it again and again.This salad is just one of the dishes I have used it in.I love this drizzled over some quinoa or even Dalia.This vinaigrette is so versatile that it will find its place in any cuisine-be is italian,persian or Indian! A healthier Dairy free version can be made by just omitting the cheese.You could also substitute the ricotta with cashew cheese. Find how to make cashew cheese on my Cauliflower Pizza with Cashew Cheese post. Do Check out some of my other most frequented salads- Avocado Quinoa Salad, Lebanese Tabouleh Salad & Quinoa Pumpkin Salad & Grilled Eggplant Salad. Cut the mint leaves into strips(Chiffonade) using a sharp knife. In a bowl, mix together the juice of lime, olive oil, mint leaves and salt.Whisk to combine. Cut or scoop the melons using a scooper into bite size pieces. Take a large salad bowl.Add the melons. Spoon over the dressing and mix it with your hands. Crumble the ricotta cheese on top.Garnish with the left over mint leaves.